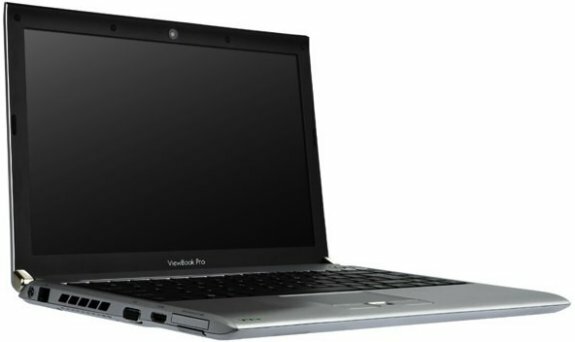 ViewSonic introduced its VNB131 ViewBook Pro, an ultraportable 13.3" laptop with the Intel Core 2 Duo ULV SU7300 processor. The system will ship in Q2 2010 for $949. ViewSonic® Corp., a leading global provider of visual display, computing and digital content solutions, today announced the commercial availability of its first ULV notebook solution – the VNB131 ViewBook™ Pro. ViewSonic's 13.3" VNB131 ViewBook Pro notebook offers fast and powerful computing with the latest ULV SU7300 Intel® Core 2 Duo processor and Windows® 7 Home Premium operating system. At only an inch thick, this thin, lightweight ViewBook Pro packs a 320GB hard drive, 2GB internal memory and a removable DVD RW Super Multi ODD into a sleek and modern looking aluminum alloy casing. With up to 12 hours of battery life, this ULV notebook is perfect for mobile warriors needing performance in a light format. In addition to offering a multi-touch keypad for enlarging screen content, scrolling, rotating and selecting items all without a mouse, this notebook features integrated 802.11b/g/n wireless, two USB 2.0 ports, a 7-in-1 card reader, HDMI and VGA connections. The VNB131 has a 6 cell battery for up to eight hours of computing at a time, plus an extra 3 cell battery that can be interchanged with the removable DVD ODD for an additional four hours of battery life – for a total of up to 12 hours. The ViewSonic VNB131 ViewBook Pro is currently available for an MSRP of $949. Additional ULV notebook and netbook solutions ranging in size and functionality are scheduled to be available in Q2 2010.